Another happy cat hanging out in a Taco Works box. 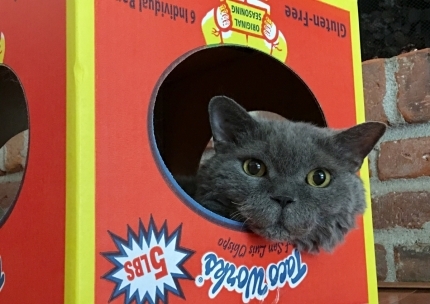 Heather says, "I'm sending because I'm sure you need yet another picture of a cat enjoying your unique box design! So, now everyone in the whole family is a fan of your chips "
Thanks for sending us the picture, Heather!